Explanation: Pointy stars and peculiar galaxies span this cosmic snapshot, a telescopic view toward the well-groomed constellation Coma Berenices. Bright enough to show off diffraction spikes, the stars are in the foreground of the scene, well within our own Milky Way. But the two prominent galaxies lie far beyond our own, some 41 million light-years distant. Also known as NGC 4747, the smaller distorted galaxy at left is the 159th entry in the Arp Atlas of Peculiar Galaxies, with extensive tidal tails indicative of strong gravitational interactions in its past. 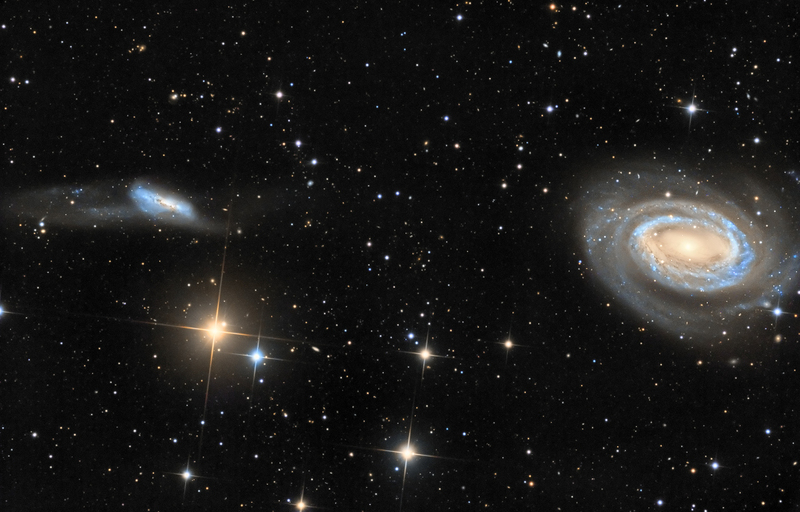 At about a 100,000 light-years across, its likely companion on the right is the much larger NGC 4725. At first glance NGC 4725 appears to be a normal spiral galaxy, its central region dominated by the yellowish light of cool, older stars giving way to younger hot blue star clusters along dusty spiral outskirts. Still, NGC 4725 does look a little odd with only one main spiral arm.